The 'birth' of Shoreditch has caused many lengthy discussions and the exact truth may never be known. One version is that Shoreditch was originally named 'Shore's Ditch' after Jane Shore, a mistress of Edward IV, who apparently died and was buried in a ditch in the area. This story is supported by a large painting at the Haggerston Branch Library of Jane Shore being removed from the ditch and there is also a shop in Shoreditch High Street with her meeting Edward IV depicted on glazed tiles. However, the area already carried the name 'Soersditch' long before Jane Shore had even been born. A more likely origin for the name (though somewhat less fascinating) is 'Sewer Ditch'. This was, quite simply, a reference to a drain or sewer in, what was then, a boggy area. It may also have been in reference to the headwaters of the river Walbrook which surfaced in the Curtain Road area. Originally part of Middlesex County, the medieval parish of Shoreditch (St Leonard's) became part of the new County of London in 1889. The parish remained the centre of the community until the creation of the Metropolitan Borough of Shoreditch in 1899. The Borough was made up of three districts - Shoreditch, Hoxton and Haggerston - and run from Shoreditch Town Hall on Old Street (recent renovations were completed in 2004) and is now run by the Shoreditch Town Hall Trust. Shoreditch was incorporated into the much larger London Borough of Hackney in 1965. Though now considered very much part of Central London, Shoreditch was originally a suburb of the City of London. At the heart was Shoreditch Church located where Shoreditch High Street and Kingsland Road are met by Old Street and Hackney Road. Until the late 90's, Shoreditch was not a popular place to live for most. For this reason it became popular with the art community and budding artists flocked to live in this cheap area. But how things have changed in the last 15 years! With such a Central location, it was only a matter of time before the true value of this location was realised and, with the popularity of 'loft style living' the area made a swift change. Since then Shoreditch has become one of the most desirable locations to live in London. The epic mix of art meets The City has created one of the most creative areas in London- both in terms of art and business. Shoreditch is renowned for its bars, nightclubs, restaurants, art galleries and fashion stores- the majority of which are privately owned and run. The growing popularity and value of the area has seen larger developers move in to the area- with mixed reactions! We have also seen larger brands like 'eat', 'PRET A MANGER' and 'Starbucks' move in to the area. But the hope held by all, is that Shoreditch can maintain the balance and stay fresh, unique and vibrant and not capitulate completely to commercial demand. More recently the area has become known for its IT industry connections with Old Street roundabout renamed 'silicon roundabout'. Google are soon to open large offices nearby and some of the UK's biggest IT success stories have been born and developed on the steps of Shoreditch. Shoreditch is a diverse area unlike any other I have known in London where penniless students, striving artists, swanky bankers, millionaire superstars and the rest of us live side by side. Long may it last! base are located in the heart of Shoreditch Triangle and have excellent knowledge of the area, its history and its property. base are one of Shoreditch's premier estate and letting agents and this is reflected in the fact that we are, by far, the most positively reviewed and recommended Shoreditch Agent on numerous online review websites. For this reason, base is a first choice for many when looking for Shoreditch accommodation. 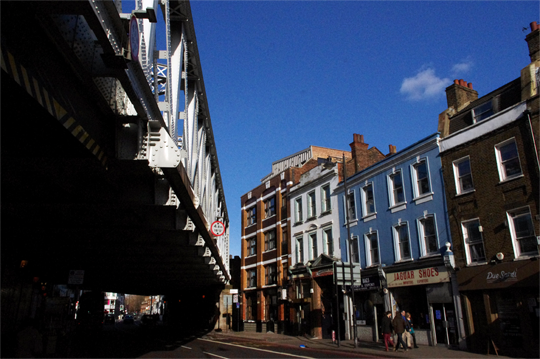 Shoreditch has established itself as a great location for 'loft living'. Some of the most spectacular loft and warehouse accommodation can be found in Shoreditch. These are popular as they offer excellent space, light and ceiling height and usually boast bare brick walls, exposed beams and large windows. More recently, larger new build developments have begun to pop-up in Shoreditch with a mixed reception. Recent notable examples include the super-luxurious Bezier Apartments at 91 City Road, EC1. Bezier is made up of 128 luxury studios and apartments with amenities including 24 hour concierge, residents' gym/sauna/steam room as well as the use of the Courtyard and roof-top gardens. There is also 'Avant Garde', currently under construction and due to complete late 2013, which will consist of 360 studios and apartments on offer from Telford Homes, as well as smaller developments like City Plaza on Curtain Road or The Foundry on Dereham Place. For more information on these and other developments in and around Shoreditch visit our 'Featured Developments' page. Truth be told, there is a wide diversity of property in Shoreditch. You can find everything- from Ex-Local Authority properties (such as the Boundary Estate) to Victorian and Georgian houses, from live/work spaces to spectacular loft apartments. Whatever you want, you'll find it in Shoreditch- you just need to have a suitable budget as prices in the area, to Rent or Buy, have risen considerably in recent years.